This is the best subcompact crossover for you if like-sized vehicles such as the Chevrolet Trax, Honda HR-V, and Mazda CX-3 are too mainstream – and the Audi Q3, BMW X1, and Mercedes-Benz GLA are too expensive. 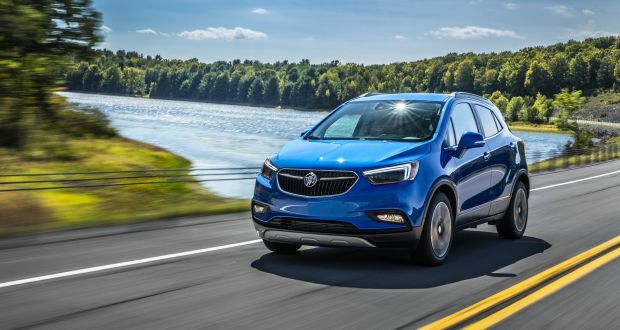 Buick’s best-selling vehicle is an intriguing ‘tweener, more upscale than subcompact crossovers like the HR-V, but not as pricey as rivals such as the Q3. That’s a key to its success. Encore helped pioneer the premium-subcompact-crossover segment when it launched for model-year 2013. Its chic styling, quiet cabin, and city-friendly maneuverability were fresh ideas to U.S. buyers, while value pricing relative to competitive premium crossovers made it an instant hit. 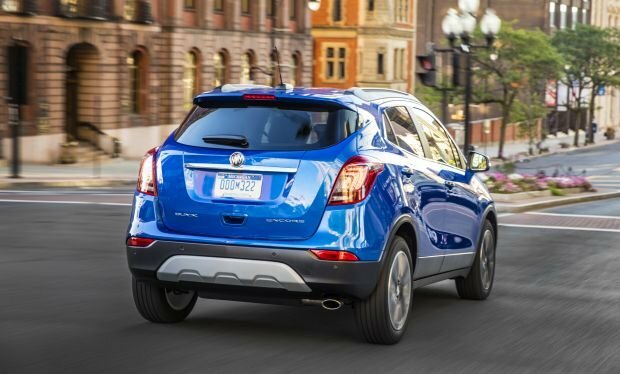 The 2018 Encore sees only minor updates after a significant model-year 2017 refresh that revised interior and exterior styling, enhanced connectivity, and added standard equipment. The updates helped sustain Encore’s sales momentum, with demand up more than 16 percent through the first half of 2017, making it the top seller in the premium-subcompact-crossover field that also includes the Infiniti QX30 (a version of the Mercedes GLA but with different styling) and Lexus NX. Note this South Korean-built Buick lends its underskin engineering and drivetrain to the Chevrolet Trax. Go for a 2018. The 2019 Encore won’t get any changes worth waiting for, but it’ll likely cost more and it’ll be a lame duck. This diminutive crossover is slated for a clean-sheet redesign for model-year 2020. Buying an ’18 gives you an extra year before the current design goes out of date. Encore’s carryover 2018 six-model lineup starts with the Base grade and ascends through Preferred, Sport Touring, Preferred II, Essence, and top-line Premium trims. All share a turbocharged four-cylinder engine and come standard with front-wheel drive. Traction-enhancing all-wheel drive (AWD) is optional on all but the Base model. Styling: “Coppertino Metallic” replaces River Rock Metallic on the paint palette, but the 2018 Encore is otherwise a duplicate of the 2017. It carries over changes that came with the ‘17 refresh, including a new grille, an updated rear end with LED taillights, and a reworked interior with new instrumentation and an 8-inch-touchscreen infotainment system with support for Apple CarPlay and Google Android Auto. Encore is just 14 feet from stem to stern, making it one of the shortest vehicles you can buy. At nearly 5-1/2-feet tall, however, headroom is surprisingly generous. Front legroom is quite good, too. And while chair-height seating makes the rear seat roomier than expected, taller passengers will wish for more knee room. Cargo volume is below the class average, at just 18.8 cubic feet behind the rear seat and 48.4 with the rear seatbacks folded. But a fold-flat front-passenger seat helps you fit items up to 8-feet long. Mechanical: All Encores team a turbocharged 1.4-liter four-cylinder engine with a six-speed automatic transmission. Standard output is 138 horsepower and 148 pound-feet of torque. Included with the Sport Touring model and optional for the Preferred II, Essence, and Premium trims is a version of this engine with 153 horsepower and 177 pound-feet of torque. We recommend ponying up for the stronger engine because it delivers snappier acceleration with minimal penalty in fuel economy. With either version, however, the transmission occasionally slurs shifts and can be reluctant to downshift when power is needed to merge into fast-moving traffic. No quibbles with Encore’s excellent maneuverability in tight spaces. All models have 18-inch wheels and tires and share suspension tuning. It won’t carve up curvy back roads like a BMW X1, but at modest speeds, Encore exhibits good cornering grip. Despite a short wheelbase (the distance between the front and rear axles), this bitty Buick rides remarkably well. It’s smooth and composed, even on pockmarked city streets. The cabin is impressively free of wind and road noise, thanks to lots of sound insulation and standard active noise cancellation. Features: All trim levels gain a convenient capless fuel filler but standard features carry over on nearly all models. The Base trim again includes a decent range of amenities, including active noise cancellation, keyless access with pushbutton engine start, a power driver’s seat, dual gloveboxes, CarPlay and Android Auto, and Wi-Fi-hotspot capability through GM’s OnStar telematics. Move up to the Preferred version for nicer cabin trim, a cargo cover, and AWD eligibility. Sport Touring models get unique wheels, a rear spoiler, integrated fog lights, and remote engine start. Preferred II models add blind-spot alert with rear cross-traffic detection and dual-zone automatic climate control. The Essence has full LED headlights, leather upholstery, heated front seats and steering wheel, a power front-passenger seat, and driver-seat memory. The range-topping Premium gains an ionizing cabin air-cleaner system for 2018 and continues with a Bose-branded audio system, front- and rear-obstacle detection, and rain-sensing windshield wipers. It’s also the only Encore available with lane-departure warning and forward-collision alert. Other driver-assistance features, such as adaptive cruise control to maintain a set distance from traffic ahead, automatic lane-maintaining steering, and autonomous emergency braking are unavailable. That leaves Encore ineligible for the coveted Top Safety Pick status from the Insurance Institute for Highway Safety, though the Buick does score well in U.S. government and IIHS crash testing. A modest $50 increase in base prices is attributed to a hike in Buick’s destination fee for 2018, to $975 from $925. We include destination fees in our base prices. With front-wheel drive, the 2018 Encore Base model starts at $23,965, the Preferred at $25,340, the Sport Touring at $26,540, and the Preferred II at $27,840. Base price is $30,040 for the ’18 Essence model and $31,490 for the Premium. All-wheel drive is a $1,500 option available on all but the Base model. Buick had not released option-price details in time for this review, but don’t expect much deviation from model-year’17 options prices. The 153-horsepower engine standard on the Sport Touring model should again add $895 to the Preferred II, Essence, and Premium grades. Expect any paint color other than basic white to again cost $395-$995. On the Sport Touring, blind-spot alert with rear cross-traffic detection and imbedded navigation should return at $495 each, with dual-zone automatic climate control an extra $275. A power sunroof, GPS mapping, and specific wheels should again be part of the Experience Buick Package available on the Preferred II, Essence, and Premium. It was priced at $2,390 for 2017. At a bit less than $30,000, the AWD Sport Touring with navigation, extra safety gear, and dual-zone climate control is our favorite Encore. Sporty styling cues give it a distinct look, and the extra power from its upgraded engine comes in handy. While the Encore Essence and Premium have worthwhile convenience and safety extras, their pricing is a bit hard to justify because similar money gets you into very well-equipped versions of roomier mainstream compact crossovers, such as the Chevrolet Equinox, Ford Escape, Honda CR-V, Mazda CX-5, or Toyota RAV4. EPA fuel-economy ratings for the 2018 Encore were not released in time for this review but you can expect them to be unchanged from the 2017 ratings. That means front-wheel-drive Encores with the 138-horsepower engine would again rate 27/33/30 mpg city/highway/combined and those with 153 horsepower would rate 25/33/28 mpg. With AWD, expect ratings of 26/31/28 mpg with 138 horsepower and 24/30/27 with 153 horsepower. These ratings are decent on their face, but given Encore’s tiny size, they’re actually a bit disappointing. At least Buick doesn’t require, or even recommend, premium-grade gasoline – all use regular-grade 87-octane fuel. Model-year 2020 is when the next-generation Encore is scheduled to debut. Buick also plans to launch a dozen “new or updated” models by then, not including those that will join its new Avenir premium sub-brand (think Denali from Buick’s sister division, GMC). Whether Encore will get an Avenir model is uncertain, but it’s a good bet the next-generation version will have design cues and features inspired by the Chinese market, where Buick sells more vehicles than it does in the United States. The redesigned Encore will almost certainly continue with a small, turbocharged four-cylinder engine, but likely will trade its 6-speed automatic transmission for an 8- or 9-speed automatic. It’ll probably weigh a little less, to the benefit of fuel economy. And expect a full suite of safety features, including autonomous emergency braking, to be standard, or at least available on all models. Finally, don’t be surprised if GM shifts production from South Korea to China to save costs. Infiniti QX30, which is a decent performer, but suffers poor outward visibility, an uncomfortable rear seat, and lackluster fuel economy; Fiat 500X, which isn’t from a premium brand but has pricing and features comparable to Encore’s. Fussy ergonomics and Fiat’s poor record for reliability should have you skipping it; Mini Cooper Countryman, which, despite BMW’s ownership of Mini, isn’t from a premium-class brand but sure is priced like one. It’s not that roomy either, and Mini is another marque that scores poorly in quality and reliability surveys. Audi Q3, which trounces Encore for interior décor and overall prestige; BMW X1, which is BMW-fun to drive and is the space leader of the group, boasting passenger and cargo room that surpasses even larger compact-class premium crossovers; Mercedes-Benz GLA, which suffers some of the shortfalls of the QX30 but overcomes them in AMG GLA45 form, where 375 horsepower gets you to 60 mph in less than 4.5 seconds.